I have participated three times in the "Treasures of the Gypsy" challenge sponsored by Pamela Armas and shown at the Houston International Quilt Festival in the fall. 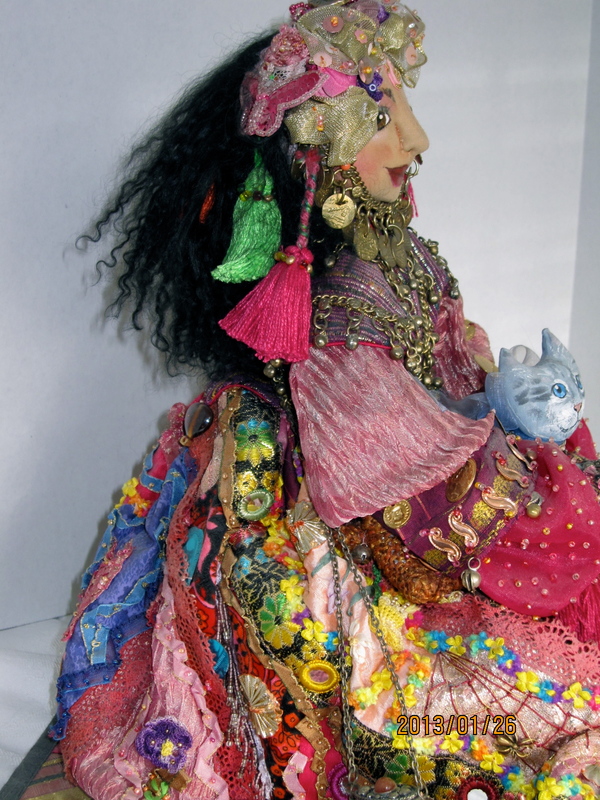 The gypsies I created for the challenge remain some of my favourite dolls and I have not parted with them. I present them as the three stages of womanhood and the cycle of life; the Maiden, the Mother, and the Crone. The first gypsy is Zinghera, Maiden Gypsy made in 2001, theme "Gypsy of the World". The maiden represents purity, beauty and the innocence of childhood dreams. She reminds us all to look after the magical child that lies within us. 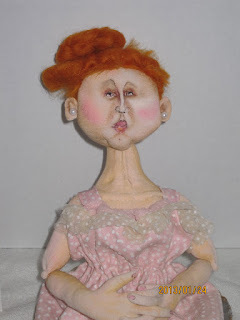 This doll won the "Best of Show" in 2001. 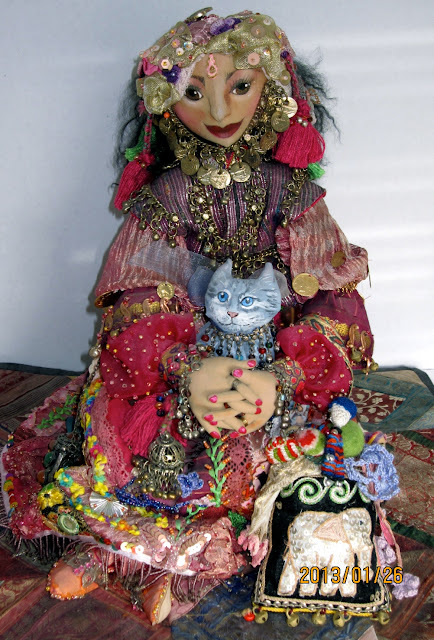 Shown with her young cat Mimi, Zinghera has travelled the world and returned home with many treasures that she will eagerly show to all her family and friends. Side view showing crazy quilting and embroidery. Close up of her face. (I used multiply body parts from different patterns to create her). The second gypsy challenge, in 2003 had the theme "Gypsy of the Night Sky". 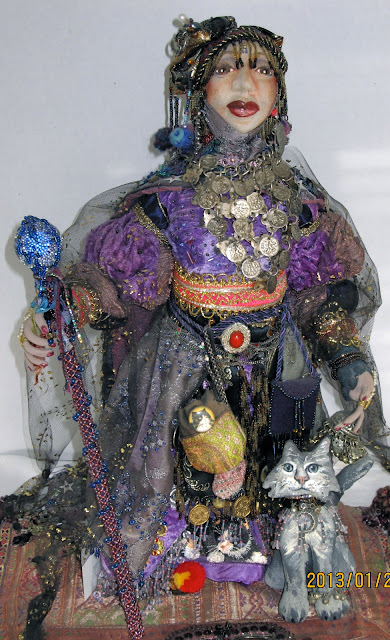 I made this gypsy as the Mother of the Night Sky. The mother figure is the life giver, source of nurturing, patience and unconditional love. Notice that her faithful cat "Mimi" is now much more mature. She won the "Gypsy Choice" award in 2003. 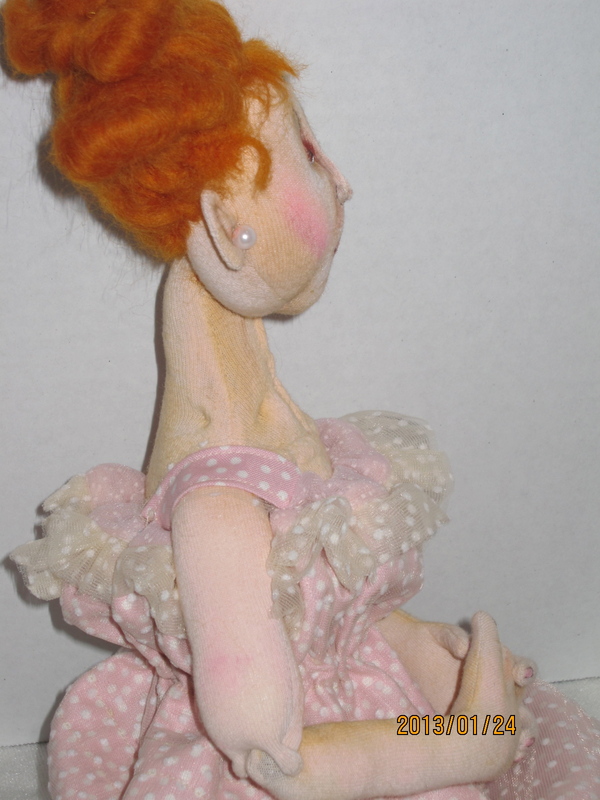 A close-up of her face (from a Kooky Davis mold, cloth overlay). 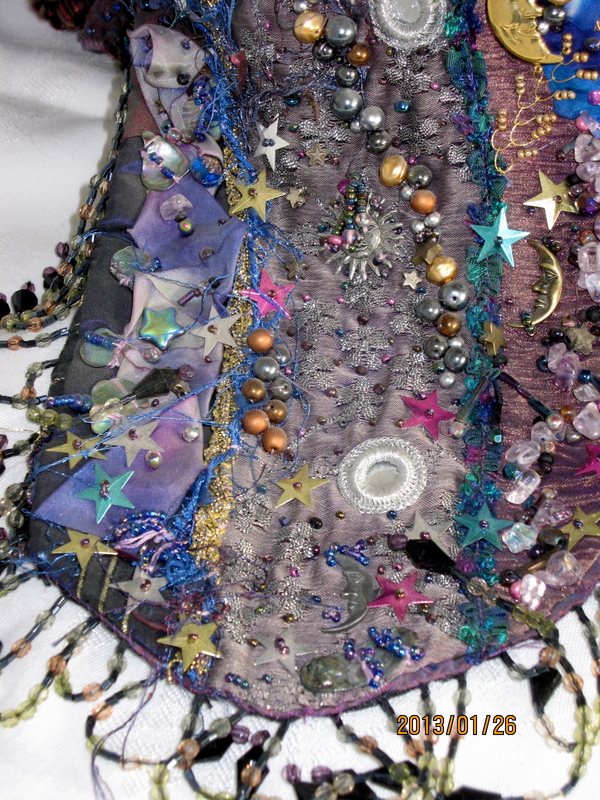 Her turban has the signs of the zodiac and hand felted and beaded "night stars". A back view showing her embroidered cape that is hand beaded with images of the night sky. 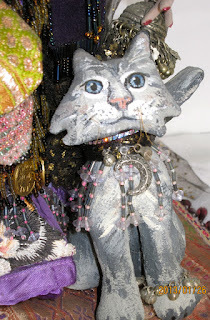 Her faithful, aging cat "Mimi"
The final gypsy challenge in which I participated was in 2005 with the theme "Jewel of the Gypsy". I completed my trilogy and used Melinda Small Patterson's pattern (Baba Yaga) to make the Crone. 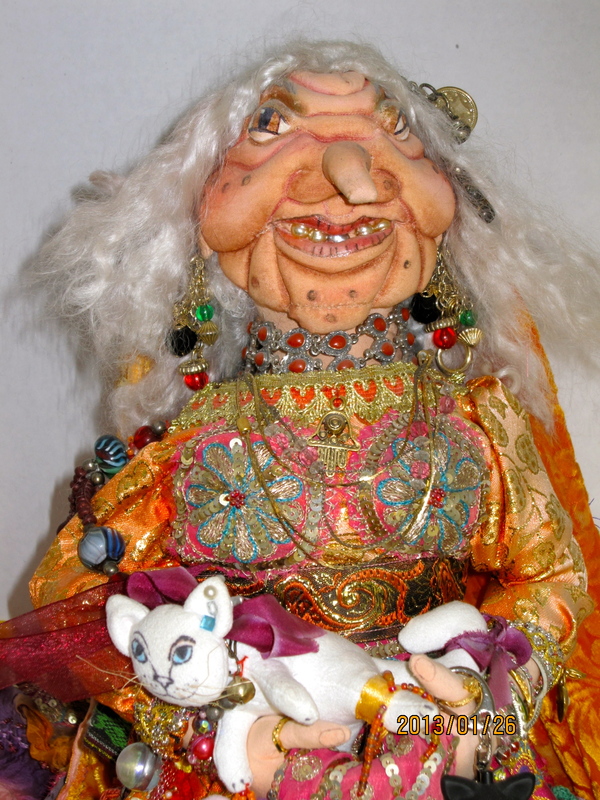 The Crone is the wise, old woman who imparts wisdom and is called upon in times of loss. She is wild and free and represents the strength in all of us. Notice that "Mimi" is gone but in her place is a rebirth, a young white kitten to start the cycle of life again. 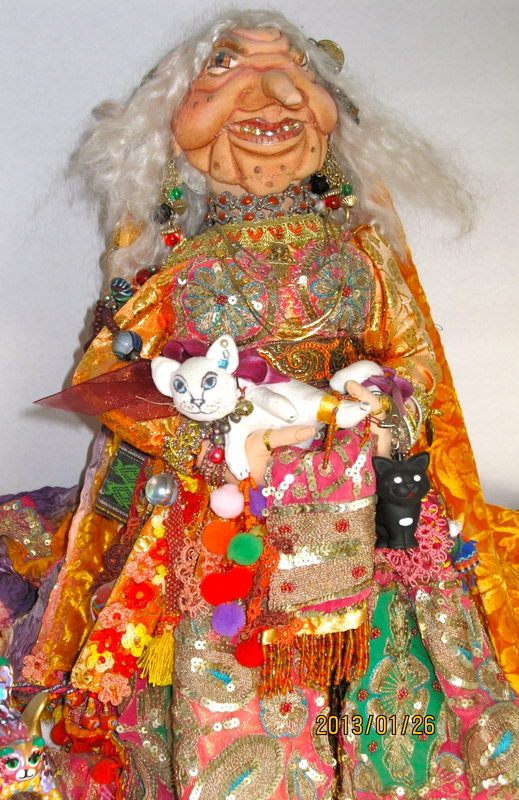 A final look at the Crone Gypsy and the start of the circle of life in the Kitten. 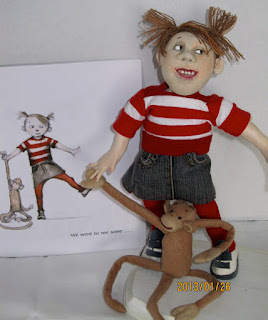 Last year our doll club, the Cloth-a-Dollics, had a challenge to make a doll based on a character in a book. I chose "Monkey and Me" by Emily Gravett, a delightful children's book that is full of sweet illustrations. 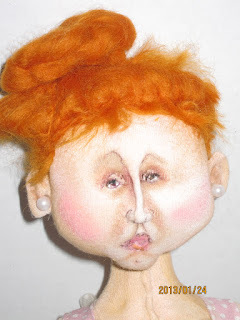 I was quite pleased with my dolls as they evoke a sense of abandon and joy. My first doll made using Akira Blunt technique. Monkey is my own design. 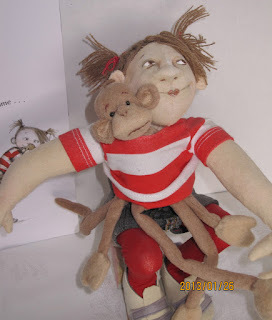 My second dolly with her monkey tucked in her shirt-what fun! The award winning children's book that inspired my two dolls. A final look at the poor monkey. I think he wants to rest! 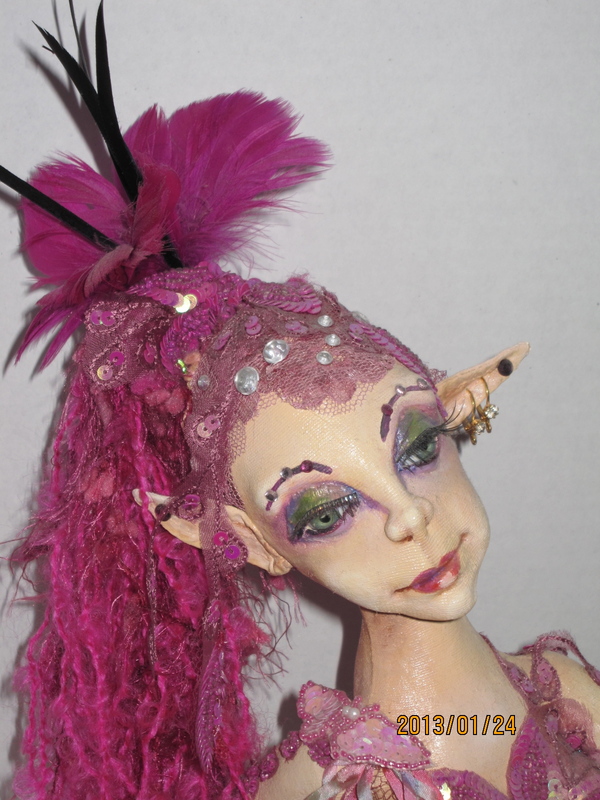 I am sharing some pictures of one of my favourite dolls that I called the Show Girl. This doll was made a few years ago when our doll club was lucky enough to have Pam Grose come and teach her "Basic Lady" workshop. 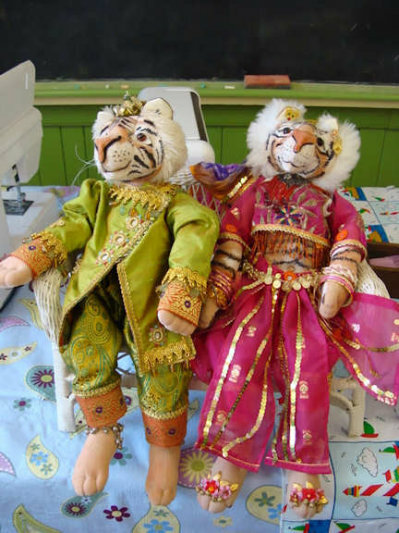 As far as I know, Pam does not have a personal site but her patterns are available on many popular cloth doll patterns sites. The Show Girl taking a break between Vegas shows. 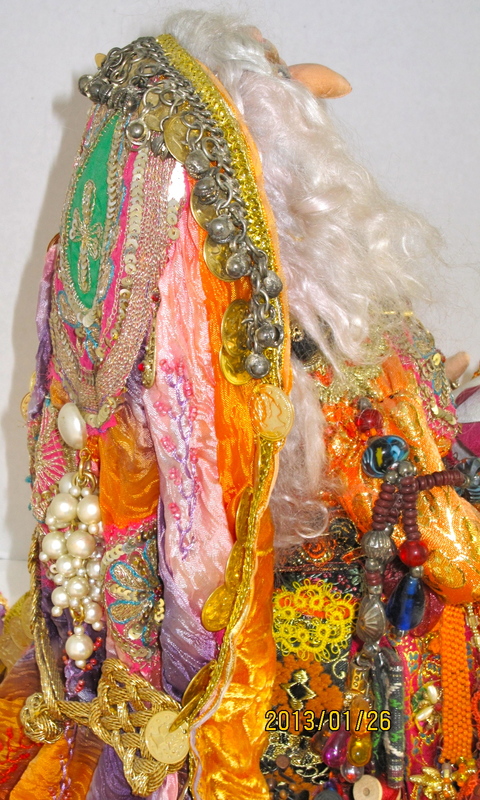 A close-up of her costume. I used velvets, tulle and organza. A close-up of her face. I love the way she turned out. Her hair is made of yarn. I knitted her beaded purse and added sequins. The Show Girl hopes you enjoyed your visit. Please come back soon! 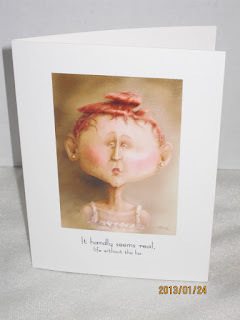 Late last year, my friend and I purchased the same greeting card that we found amusing. The card designer is Susan Mrosek, Pondering Pool. We loved the card so much that we challenged each other to make an art doll based on the greeting card! 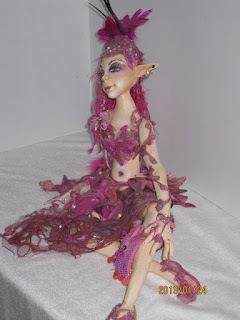 My friend would create the doll using polymer clay and I would use cloth. Let the fun begin! Here are our efforts for you to enjoy. To view additional pictures of my friend, Romona's finished doll go to her blog, Northbrook Designs. As soon as I was happy with the face, I decided to use the body pattern from Allison Marano called Phidias. I was very happy with her body once I tweaked it to fit the face I created. 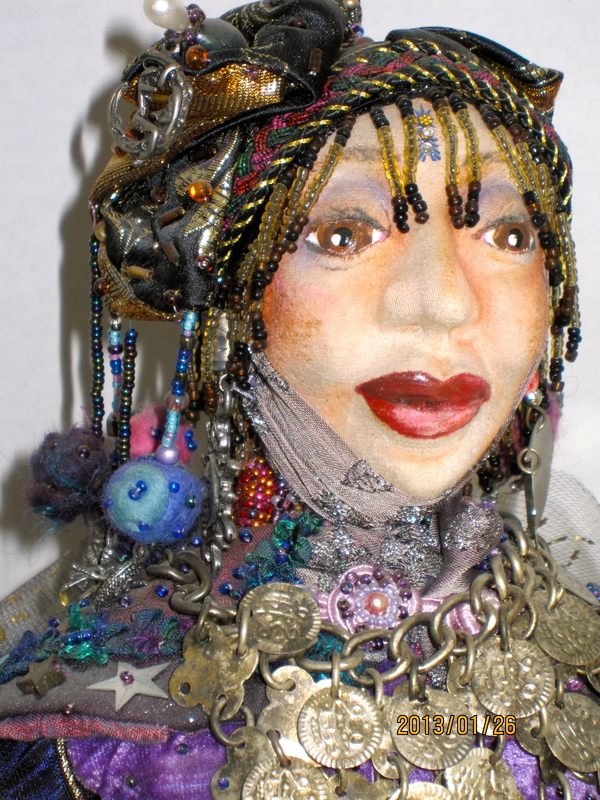 My finished doll. I named her Melancholy Millie! Millie's sandals, are they not too cute! Melancholy Millie and Pensive Pearl (on the left, made by my friend Romona. A final look at Melancholy Millie. "It hardly seems real, life without the ha." I do hope Millie gets her humour back, poor lass. I made this doll a number of years ago as a challenge where we were given fat quarters and the theme of "party time". It was just after the movie "Little Miss Sunshine" was out and as soon as I saw the bright orange fabrics, I decided that the doll would be called "My Little Sunshine". She is an original design, all cloth with fine yarn hair. Although I no longer own this little lady, she is still one of my favourites for she makes me smile every time I see her. As you can see she has just finished with her ballet lesson (shoes hanging from her bike) and now she is ready to party with her raggedy anne and andy dolls. 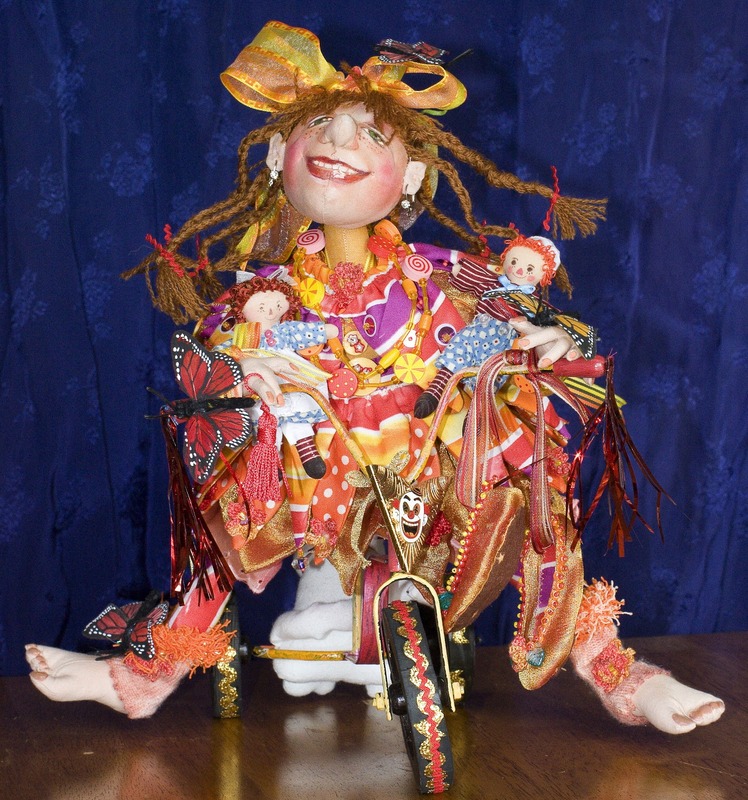 This doll was very well received as she evokes the joy of childhood innocence and play. This is a sample post. I am just learning! Below is a picture of two dolls I made from a Karen Shifton pattern called "Pawsha".